Two tree-ts in one! 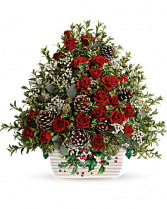 Designed to evoke a festive Christmas tree look, this stunning seasonal arrangement is presented in a classic oven-to-table stoneware serving dish for years of delight. 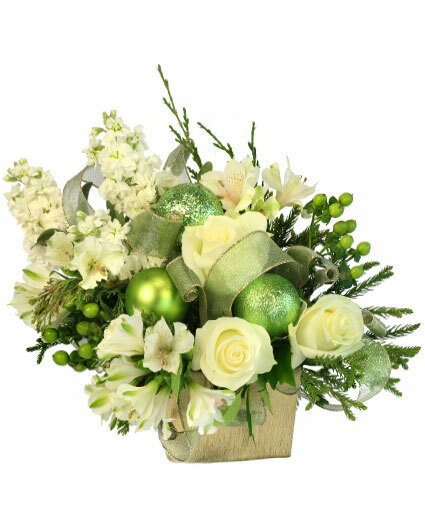 Your wishes for a classic Christmas centerpiece have come true! 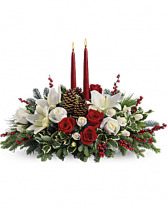 This elegant arrangement features two glowing red candles atop a bed of noble fir, white pine and luxurious roses.